“What is the path?” Zen Master Nan-sen was asked. “Everyday life is the path,” he answered. Venerable Hwasun Yangil Sunim conveys the universal truth by letting the benevolent Buddha light out to glow in action. And his master has remarked, “Whenever he delivers the Mujung Dharma,* its power moves heaven and earth and makes the day into a glorious Tathagata trance.”Sunim Yangil serves as the Zen master of the Dae Kak Sa Temple and the Awakened Meditation Centre in Toronto, Ontario and their affiliates. 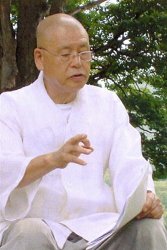 He teaches the practices of mindfulness and of the Korean Ganhwa Zen meditation that looks into the live word of a question or konggan (Japanese: koan) and which seeks the unfolding of the mind’s innate enlightenment.The venerable master was ordained as a monk in the celibate Jogye Order that boasts of a rich Zen tradition of conveying the Buddha mind in an unpretentious, rustic and earthy way. He trained with the late Venerable Kun Wol Ha Sunim, who served as the Grand Zen Master of the Tongdo Sa Monastery and from 1994 to 2004 as the Supreme Patriarch of the Jogye Order and the other sects as well as the lay Buddhists in Korea.In 1986, Yangil Sunim settled in Canada at the request of his master to spread the seeds of Dharma in the West. He has taught Zen meditation to the students in Canada and USA as well as in England, China, India, Sri Lanka, Philippines, and his home country. The Chinese sangha honoured the venerable master with the distinguished title of Tripitaka Master and the Sri Lankan sangha gave him the title of Honourary Supreme Patriarch. Yangil Sunim serves concurrently as the president of the Sangha Council of Ontario Buddhist Ministry, the Buddhist Council of North America and the Maha Prajna Compassionate Society International. * a discourse on the universal truth by a non-sentient object.